We travel to see new places and have new experiences. We travel to encounter different cultures and interact with unknown people. We travel because leaving home makes us appreciate home. Two of the best aspects of travel are food and drink. Every region in the world has its own dishes, specialities, and twists on the familiar. Every region has its beverage. We drink Scotch in Scotland, wine in Bordeaux, and beer in Munich. We discover what it’s like to siphon beer in a cafe in Vietnam and drink strong coffee mixed with sweetened condensed milk in Thailand. We drink emoliente in Peru and Chai in India, and we discover something about the people of these lands as we sip what they sip. It’s possible to encounter the unfamiliar in our own backyards, as well. It’s possible to see something we’ve never seen or try something we’ve never tried just a few miles from home. We just have to keep eyes open, ears alert, and noses sensitive. With this in mind, we invite you to travel to the Olympic Peninsula for a Culinary Adventure. Embark on a culinary adventure across the Olympic Peninsula. Follow the Olympic Peninsula Culinary Adventure to a variety of restaurants, markets, and Washington State Wineries on the Olympic Peninsula. Circle the Olympic National Park, from north to south or south to north. Along the way taste locally crafted artisan cheese in Port Townsend at the Mt. Townsend Creamery, shop for fresh produce grown in the Dungeness Valley at Nash’s Organic Produce in Sequim, and visit the Hama Hama Oyster Farm and Seafood Farm in Liliwaup. Dine at the Geoduck Restaurant and Lounge in Brinnon, the Olympic Timber House in Quilcene, and the Ajax Cafe in Port Hadlock (where you can have great fun trying on an assortment of hats while waiting for your meal). Save room for locally caught seafood at Linda’s Wood-Fired Kitchen in Neah Bay, local clams at the Wildfire Grill in Port Angeles, and the creative fare at the Alder Wood Bistro in Sequim. Most food is best enjoyed with a glass of Washington Wine or Cider. 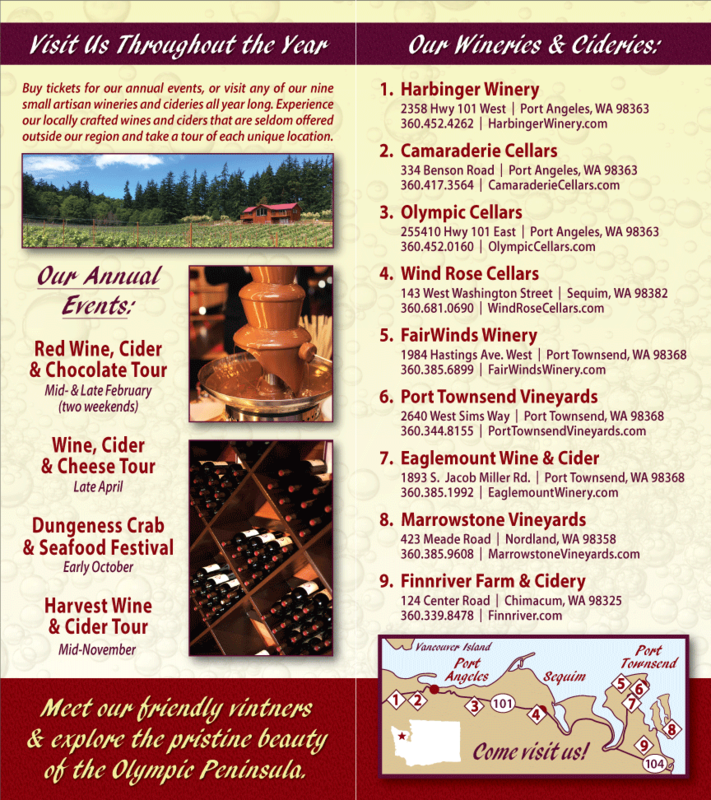 OPWA members Finnriver Farm & Cider and Olympic Cellars Winery are participating in the Olympic Peninsula Culinary Adventure. Other member wineries are an extra bonus, and well worth visiting when on the Olympic Peninsula. If you embark on an Olympic Peninsula Culinary Adventure between September 1 and November 30, 2011, you’re eligible to win all sorts of interesting prizes. Email adventure@seattledining.com for more details. Additional information is available at Olympic Culinary Loop.